This installment’s topic is a practice management headache no physicians or office managers want to imagine could happen to them. We’re talking about embezzlement … getting ripped off from the inside … how to prevent it and how to treat it if it does show up in your practice. Our guests in this installment are two of Texas Medical Association’s expert staff members. Peggy Pringle is the director of TMA Practice Consulting. With practice management experience, knowledge of best practices, and access to TMA’s tools and resources, a TMA consultant can provide customized solutions specific to your practice. Jeppe Gustin-Ross is TMA’s associate vice president for human resources. Jeppe is a frequent speaker at TMA practice management seminars and an expert in personnel law and tactics. What do we know about the embezzlement problem? How big is it? Who is most at risk? One way to prevent being ripped off from the inside is to hire good, honest people up front. How can physicians make good recruitment decisions? What steps should physicians take to protect themselves? How can a practice detect if someone is actually stealing from the inside? What do physicians need to know about terminating a staff member they suspect of embezzling the practice? Starting May 23, all claims for reimbursement must carry your National Provider Identifier (NPI) or they will be rejected. This includes claims for Medicare, Medicaid, or any commercial health insurance plan. State insurer regulators have taken action against a silent PPO, fining Great-West Life & Annuity Insurance Co. $8,000 for inappropriate physician discounts on claims. The TMA House of Delegates efficiently dispatched an immense agenda at TexMed 2008 in San Antonio. Partner With the John P. McGovern Foundation! The John P. McGovern Foundation in Houston, a longtime supporter of the TMA Foundation's work, has pledged to match the first $10,000 in contributions to the 2008 Star/Superstar campaign. Josie R. Williams, MD, was sworn in as TMA's 143rd president during TexMed 2008; William H. Fleming III, MD, was selected as president-elect. The best-selling medical title in the world now is available free to TMA members in a completely revised and updated 17th edition. The Emergency Medical Treatment and Labor Act (EMTALA) Technical Advisory Group has made its final report to U.S. Department of Health and Human Services Secretary Mike Leavitt. HHS established the group to examine EMTALA's impact on medical care. Physicians and other businesses have more time to file their state franchise tax returns or seek a filing extension without having to pay a penalty. The Texas Department of Insurance Division of Workers' Compensation says it has received complaints that some insurance carriers and billing review companies are improperly denying payment for medical services because of lack of documentation. Volume 1: Practice Operations: Embezzlement, complaints, good hiring, and more. Who can better help you manage your practice than the experts at the Texas Medical Association? From tons of free advice for members to outstanding seminars and publications to our top-rated consulting team, TMA’s range of practice management services is unsurpassed. For the past eight years, we’ve been packaging nuggets of this vital information into TMA Practice E-Tips, a free, bimonthly e-mail newsletter for TMA member physicians and their office staff. TMA Practice E-Tips provides inside advice and practical solutions for managing a successful medical practice. Each edition provides hands-on, use-it-now advice on coding, billing, reimbursement, HIPAA compliance, office policies and procedures, practice marketing, and much more, along with useful links for additional information. 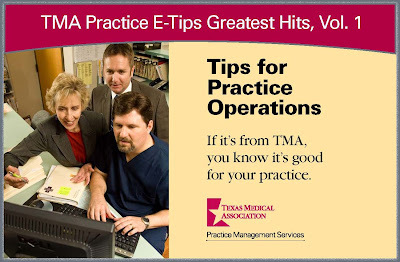 Although we catalogue and stockpile each e-tip on the TMA Web site, it really bothers us that so much great advice and information may be going unused — and just at a time when Texas physicians need all the help they can get. That’s why we sent our staff digging through the archives to find the very best e-tips for our Greatest Hits series. If it’s from TMA, you know it’s good for your practice.